The starting point of any Ural Kaleidoscope tours is in Ekaterinburg. We’ll meet you and send you on a trip to the Ural fairy tale - the one that you have chosen. If your tour does not begin on the day of your arrival, make sure to take the opportunity to wander around the city. Exciting impressions and great photos are guaranteed! In Ekaterinburg there is a barometer of the mood that displays the state of mind of all residents of Ekaterinburg. There’s also a monument to Michael Jackson and the point of intersection of the financial flows – if you touch it you’ll doom yourself to ... wealth! Only here you can take a picture by the monument to a plumber or near the two-meter high Berlin bear, capture a monument to the keyboard, the invisible man, a huge kitchen grater, credit card, or even a monument to curiosity! Well, where else can you see such miracles? Ekaterinburg will show you a place where the famous meteorite fell - now it's an art object called “Golden Crater”. In our city there are thousands of fascinating objects! Ural Kaleidoscope will take care of every detail to make your journey enjoyable. Want to have more thrilling experiences at once? Then get ready for the first trip – there place where only one step decides whether you are in Europe or Asia. 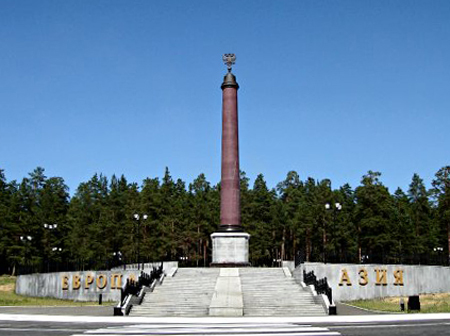 We are ready to drive you to the border of the two parts of the world, which is also located in Ekaterinburg. Ural Kaleidoscope – the most educational tours, the most original tours, the most helpful staff and the heartiest welcome in Russia!